When using a kitchen knife, or any sharp object, remember to put safety first. Although it sounds obvious don’t run around with a sharp knife in your hand, don’t point a knife at anyone and always cut away from yourself not towards yourself. Also, don’t use your finger to see how sharp the blade is. Yes, I know some of you reading this article have been guilty of this at least once and have found out that the edge of the knife was indeed very sharp because you cut yourself on it! Another important safety tip is to never use the knife for other than its intended purpose. No, a sharp kitchen knife should not be used as a makeshift screwdriver or as a device to try and pry open a locked door that you can’t find the key for. Nor should it be used to pry apart a stack of frozen hamburger patties. You could easily cut yourself if the knife slips and you are also in danger of breaking the tip of your knife off. Also, don’t use your kitchen knives to cut the tops off plastic jugs or to cut cardboard boxes unless you want to almost instantly dull your knife. Use a scissors or utility knife for those jobs. When you buy a kitchen knife you get what you pay for so invest in the best quality knives you can afford and buy them from a reputable dealer. A fully forged carbon knife is the highest quality knife you can buy. High carbon stainless steel knives are also pretty good. Regular stainless steel knives aren’t as good and won’t last you as long but any knife will last longer if you take care of it properly (and most people don’t care for their knives the way they should). 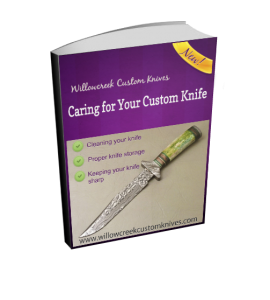 What should you do to properly maintain your knives? Below is a list of 6 important knife care tips. 1) Never ever, and I repeat NEVER, put your knives in the dishwasher. The harsh chemicals from your dishwasher detergent will pit your knives and the dry cycle will also damage your knives. In addition, if the sharp edges of your knives bump up against anything else, like your plates, it will damage and dull your knives. Instead, as soon as possible after using your knives, wash them by hand with a mild detergent and hand dry them. Don’t allow the knives to drip dry because moisture will dull your knives and will damage the wood handles of knives. 2) Always use a cutting board. Don’t cut on your countertop. Not only is cutting on your countertop bad for your countertop, it’s bad for the blade of your knife too. And never use a glass cutting board. Glass cutting boards may be pretty but they are also pretty horrible for a knife. It’s a quick way to dull and ruin a knife. 3) Regularly use a honing steel to maintain the edges on your knives, but learn how to use the honing steel properly. To learn the right technique, ask the dealer where you buy your knives to sell you a good honing steel and to also show you how to use it. 4) Have your knives professionally sharpened. Although there are lots of knife sharpeners available for in-home use, I don’t recommend using them. It’s too easy to permanently damage your knife. Instead use your honing steel regularly and take your knives to a professional for sharpening a few times a year. If you take care of your knives properly you won’t need to get your knives sharpened more than a few times a year depending on how much you use your knives. 5) Don’t store your knives in a drawer with lots of metal objects, such as your kitchen utensil drawer. The edges of your knives will get banged against the other metal things, damaging and dulling the edges of your knives. You can still store your knives in a drawer, but don’t have that drawer crowded full of other items. Just keep your knives in that drawer. Another option is to use a wood block to store your knives. 6) Use the correct knife for the task at hand. Don’t use your serrated bread knife for chopping and dicing. Don’t use your boning knife to slice your bread. Instead, use a chef’s knife (also called a cook’s knife or a French knife for chopping, slicing and dicing. Use a paring knife for peeling and trimming, and for cutting and slicing small items. A utility knife is great for slicing meat and cheese. A boning knife is for cutting meat and poultry. A fillet knife is a great for cutting fish. And, as you would expect, a bread knife’s best use is cutting bread. With proper use and care, your knives will last you a long time and will help make your kitchen cutting tasks easier and more enjoyable.